Updating its D5200, Nikon has introduced its $800 D5300 DX-format dSLR with a 24-Mp CMOS sensor, no low-pass filter, built-in WiFi plus GPS, a 3.2-inch LCD and support for 1080p movies at 60p. The body will be available in black, red or a new gray color. Nikon D5300. Interesting WiFi options in a monocoque design. Also worth noting is the structural design which bolts the the innards to the shell, much like your old Lotus 25. The technique assures "a smaller and lighter body while maintaining the necessary strength and durability," Nikon explained. Transfer: Images can be resized and transferred to a smart device over a wireless connection for view on the smart device display or upload to the Web. Manual upload: You can manualy select images to be uploaded and you can specify images and file size to be uploaded to a smart device later. Remote shooting: The D5300's Live View display can be displayued on the smart device's screen, enabling remote control over shooting. Lever. Smoother zooming and focusing for movies. The D5300 is also the first Nikon dSLR to include a GPS radio. While some Nikon digicams have included GPS (and some with very nicely implemented mapping and location features, which are not mentioned by the company in its description of the D5300), this is the first dSLR to have a built-in GPS radio. Nikon mentions both Nikon View software and its Nikon Imaging Space Web site as resources for mapping images but nothing built into the camera. The company also announced a zoom/focus assist lever for "smoother zooming and focusing" that should make it indispensable for capturing movies. As the illustration suggest, you need two: one for focus and the other for zooming. The best image quality and definition in its class enabled by an effective pixel count of 24.2-million pixels, no optical low-pass filter and the new EXPEED 4 image-processing engine. An entry-level model equipped with a vari-angle monitor and the first Nikon dSLR camera to offer built-in WiFi and GPS functions. 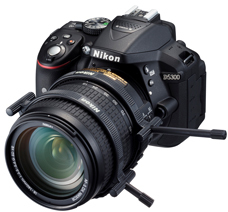 TOKYO -- Nikon Corp. is pleased to announce the release of the D5300, a Nikon DX-format dSLR camera. The D5300 is Nikon's latest entry-level model. It offers an effective pixel count of 24.2-million pixels and is equipped with a Nikon DX-format CMOS sensor with no optical low-pass filter, as well as the new high-performance EXPEED 4 image-processing engine. It is Nikon's first dSLR camera to offer built-in wireless LAN (WiFi ) and GPS functions, which enable simple sharing of high-quality images captured with the D5300 and Nikkor lenses offering superior rendering performance via a smart device. These functions also allow users to look back on routes taken on vacation or with outdoor activities using a log feature that is part of the built-in GPS function. The D5300 is also designed with a monocoque structure made of a new material that enables a smaller and lighter body while maintaining the necessary strength and durability. The camera is also equipped with a number of features that support various shooting situations, including a 3.2-inch, approximately 1037k-dot vari-angle monitor with wide viewing angle that enables flexible shooting from a variety of angles, a full-HD movie recording function that supports recording of smooth 1920x1080/60p movies and a Special Effects mode with nine options that can be applied to photos and movies with shooting for a variety of creative effects. The D5300 offers an effective pixel count of 24.2-million pixels and is equipped with a DX-format CMOS image sensor developed exclusively by Nikon. It supports a broad range of standard sensitivities, from ISO 100 to ISO 12800, as well as additional expansion up to ISO 25600 equivalent (Hi 1), for high-definition images exhibiting very little noise with shooting at a broad range of sensitivities. In addition, the latest image-processing engine, EXPEED 4, optimized to be even faster for high-performance dSLR cameras, provides significantly better results with noise reduction, auto white balance, color reproduction characteristics and tone processing. What's more, the absence of a low-pass filter maximizes the superior resolution of the high pixel count and rendering capabilities of Nikkor lenses. As Nikon's first dSLR camera equipped with a built-in WiFi function, high-quality images with an effective pixel count of 24.2-million pixels captured from a variety of angles using the flexible vari-angle monitor can be transferred to a smart device for sharing with others. This expands the ways in which images are enjoyed after they are taken by enabling immediate image transfer for sharing photos with family and friends via blogs or social networking sites anytime, anywhere. Transfer function: Images captured by the D5300 or already saved to a memory card inserted in the D5300, can be transferred to a smart device over a wireless connection. Transferred images can be viewed in the smart device display or uploaded to a blog or social networking site. In addition, the size at which images are transferred to a smart device can be selected from two options in accordance with smart device storage capacity. Manual upload function: Users can select images to be uploaded to a smart device using the D5300 monitor display. In situations or environments that do not sufficiently support immediate image upload or when a smart device is not readily available, the camera can be used to specify images and image file size, to be uploaded to the smart device at a later time. Remote shooting function: The D5300's live view display is shown in the smart device display, enabling remote control over shooting. The camera's live view shooting display is shown in the smart device display, allowing users to accurately frame photos and predict results with remote control over shooting. The D5300 is Nikon's first dSLR camera with a built-in GPS function, enabling recording of location data (longitude, latitude, altitude) with images. Collaboration with ViewNX 2, Nikon Image Space and commercial mapping software enables display of images where they were captured on maps, as well as sharing of images with location data. What's more, the A-GPS function makes detection of location data smoother. This capability allows users to look back on memories or track their movement, on vacations or with outdoor activities by shooting location and date and time of capture. 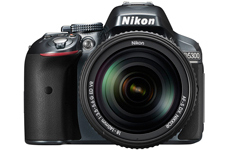 The D5300 is designed with a monocoque structure utilizing a new material. As the camera cover and body are formed with a rigid, integrated structure, there are fewer joints. This enables a smaller and lighter camera with a width of 125mm, height of 98mm and depth of 76mm and weighing just 530g, all while maintaining the necessary strength and durability. Adoption of a larger 3.2-inch, approximately 1037k-dot LCD monitor with wide viewing angle ensures a crisp, clear display. The side-hinged vari-angle monitor opens from 0 to 180 to the side and can be rotated up to 90 clockwise and up to 180 counter-clockwise when it is open. This enables shooting from a wide variety of angles, from low to high and making even self portraits possible. The D5300 is equipped with a D-Movie function that supports recording of 1920x1080/60p movies. The combination of Nikkor lenses, an effective pixel count of 24.2-million pixels and the new EXPEED 4 image-processing engine provides movies with excellent resolution and very little in the way of noise, color aliasing or moir patterns. In addition, autofocusing during movie recording is possible using contrast-detect AF. When the focus mode is set to full-time-servo AF (AF-F) and AF-area mode is set to Subject-tracking AF, the camera automatically maintains focus on moving subjects. Manual movie settings are also available, allowing users to choose the desired shutter speed and ISO sensitivity in live view mode and with movie recording. Movie frame rate with full-HD recording can be selected from 24p, 25p, 30p, 50p and 60p. In addition to recording of high-quality sound via the built-in stereo microphone, the optional Stereo Microphone ME-1 can also be used to record stereo sound. The D5300 is equipped with a Special Effects mode, with which effects can be selected and applied with recording of both still images and movies. Preview in the camera monitor before shooting or recording begins allows users to confirm the results of effect selection in real time. Users can choose from a total of nine special effects, including the seven built into the D5200 (Selective Color, Color Sketch, Miniature Effect, Night Vision, Silhouette, High Key, Low Key), as well as the new Toy Camera Effect and HDR Painting. This allows users to easily enjoy dramatic effects like those seen in art and the movies. This mode was adopted to respond to the creative intent of users searching for a way to express their own unique style and creativity. Toy Camera Effect: Create photos and movies in which colors have been changed and edges have been shaded so that they appear to have been recorded with a toy camera. Users can adjust the vividness and degree of vignetting (peripheral shading) from three options each to suit their individual preferences. HDR Painting: The camera shoots two frames at different exposures and combines them, with processing that changes color tones, for HDR images with a painterly effect. The D5300 grip is designed to fit comfortably in the palm of the hand for a firm hold using just one hand, making framing via both the optical viewfinder and the monitor's live view display easier. Further, in addition to the popular black and red colors, the D5300 is available in a new gray option. In addition, metal parts, such as the microphone cover and plate over the mode dial have a surface finish that gives the camera an elegant appearance. The NAL-1 is a lever that enables smoother zooming and focusing when attached to the zoom ring or focus ring on a Nikkor lens. It is especially convenient with movie recording.